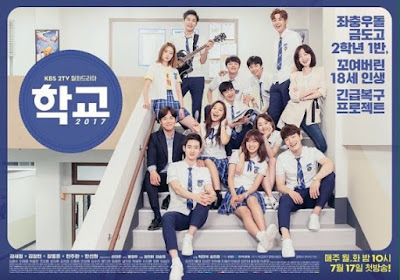 School 2017 (Hangul: 학교 2017; RR: Hakgyo 2017) is a South Korean television series starring Kim Se-jeong, Kim Jung-hyun, Jang Dong-yoon, Han Sun-hwa, and Han Joo-wan. It premiered on KBS2 on July 17, 2017 and airs every Monday and Tuesday at 22:00 KST. The series is the seventh installment of KBS2's School franchise. Plot: A coming-of-age story about the lives of 18-year-old high school students who are valued according to their ranking in school. Despite their frustrations, they find out how to make their own way in this world that seems to be a stagnant cycle of school and home.